Joseph Beuys, In difesa della Natura. Exhibition view at the Venice International Performance Art Week (2014). Photograph by Samanta Cinquini. With his life and works, Joseph Beuys is the most outstanding representative of the anti-traditional and centrifugal force of contemporary art in the past decades. An outsider in artistic currents (any attempt to include him in Minimalism, 'Poor Art', Performers or Conceptual artists has always been vain), Beuys was able to enwrap himself in art and imbue art with his personality. This means a great deal more than the everlasting concept of the unity of life and art. Putting himself within his works of art, Beuys enhanced the anthropological power of art as a whole. Joseph Beuys was born in Krefeld, West Germany, on May 12, 1921 and had an early demise in Düssendorf on January 23, 1986. He spent his childhood in Kleve, a small town on the west bank of the Lower Rhein, a lowland rich in marshes. His homeland greatly influenced the artist, as well as his studies of natural sciences. As a young man, Beuys did not neglect other branches of learning, such as art (fostered by his visiting the studio of a sculptor, Achilles Moortgat, in Kleve), literature and philosophy – from Romanticism to Knut Hamsun, Kierkegaard and Nietzsche – as well as music, especially Wagner and Satie. Of course his biggest interest lay in social solidarity; indeed, he decided to study medicine at university. In 1940, after his grammar-school diploma in Kleve, the war changed his plans, as he enlisted in the Luftwaffe as a dive bomber pilot. In 1943, while engaged in battle on the east front, his stuka crashed in a lonely Crimean plain during a snowstorm. A tribe of Tatars found him buried in the snow, with a serious head wound and almost frozen to death. They rescued him and saved his life by smearing his body in fat and wrapping him in felt. The idea of generating heat by means of natural materials is a recurring feature in his works. After the war Beuys had deeply changed, both physically and mentally. It was then that he decided to become an artist. In 1947 he enrolled at Düsseldorf Kunstakademie and got a degree in 1951. As usual, he did not restrict his research within the boundaries of art. In that period he was deeply influenced by Rudolph Steiner, the founder of anthroposophy, who became a constant inspiration in his later works. In 1961 he became Professor of Monumental Sculpture at Düsseldorf Academy of Arts. In the early 1970s he started co-operating with Georg Maciunas, the American founder of Fluxus, and took part in several public performances held by this group. Among the members of the Fluxus project, it is worth mentioning Nam June Paik, Wolf Vostell, John Cage and Daniel Spoerri, Charlotte Moorman, Robert Filliu, Bazon Brock. A basic concept that Beuys shared with Fluxus was the idea of art as an instrument for conscience-building. In other words, art is everywhere and is meant for everybody. At the same time he started exhibiting his own works, such as events, sculptures and drawings. Some of the best-known works of that period are How To Explain Pictures to a Dead Hare (1965), Eurasia and Homogeneous Infiltration for Piano (1966), Vakuum Masse (1968), Show Me My Mountains(1971). These works were used to better define his artistic identity, which can never be fully identified with the existing currents. In the late 1960s the artist more deeply approached the social and political aspects of the culture of that time. In 1967 he founded the Student Party, in 1971 the Organization for Direct Democracy By Referendum and in 1974 he set up the Free International University with Heinrich Böll. This latter move was partly due to his dismissal from the Academy in 1972, after his disagreement with the Chairman and then the Minister of Finances as he insisted that his classes be open to any students who wanted to take them, even if they had failed the entry test. His choice was not due to excessive weakness but was based on the intention of revising the entry criteria in higher education. In his opinion university is not meant for those who are already able but those who want to reach a certain goal but do not yet have any specific knowledge. Between the late 1970 and the early 1980, within the scope of F.I.U., Beuys got involved in the growing Green movement, which was a trans-party, non-ideological political force at that time. As is well known, the scope of activity of this movement mainly deals with environmental and ecological issues, thus addressing the issue of theDefence of Nature which has been constant over the last years of Beuys's activity. However, Beuys soon discontinued his support because the movement became a proper party, losing its spontaneous quality of a self-organized social aggregation. Any organization created by German artists always featured and demanded a proud self-sufficiency and autonomy from all power systems. Their main objective was to progress without any compromise, which would jeopardize the truth and uniqueness of the movement from within. All the organizations founded by Beuys reflect his nomadic soul, in continuous search for the anthropological heritage that men have neglected in their foolishness. A lot of information on Joseph Beuys has been disseminated in the field of international culture through the press and literature, influenced by market demands and the high price of Beuys' works (many of which are common objects such as a sledge, a felt suit, wine, a shovel, oil, a hoe...) that auction houses in London or New York bring on the international art business scene. But many wonder who Joseph Beuys really is, whether he is an extravagant artist in a felt hat, a poet, a nature lover, a philosopher or a preacher. Joseph Beuys was essentially a man who loved man and nature, inhabited by man. He did not invent any new method, but devoted his life to the search for an improvement in the existing methods, and he did so with generous humaneness. As a man and an artist, Joseph Beuys had always been interested in pursuing such issues as the crisis of modern man and the loss of identity. He sought an access route to truth in reality, because truth is already present in the world we live in. Men do not need to invent an arbitrary system in order to find it. All they have to do is rediscover it in themselves and nature. Man and nature reconciled will build a truer world. This is the basic concept of Beuys's thought. Joseph Beuys placed man at the centre of his artistic research, focused on man and human creative power. This is the main reason for his interest in politics, economy, agriculture, ecology and man's common issues. I have always considered Beuys as a diamond. A diamond is a multi-faceted stone, where one can see all facets through the others, while maintaining an overall compactness and unity. Therefore, in order to understand Beuys' work and be able to judge it, it is of the utmost importance to consider it in its overall complexity without limiting our analysis to its formal aspects. Every one of its many facets need to be taken into account at the same time, with its social commitment and its various suggestions and implications, in order to understand the true reason and aim of his artistic involvement and works. Beuys always sought a contact and comparison with the ideas of past intellectual figures, such as Goethe, Steiner, Schelling, Novalis and others, in that he believed that valuable theories and opinions, which could be useful to modern man, could only be created through comparison with other ideas and past influences. However, he was only too pleased to converse with anybody, whether students, farmers or intellectuals, as he greatly prized communication as a fundamental value in any social relationship and all fields of creative work. Beuys believed creativeness to be closely linked to human nature as a whole and never disjointed by a strong bias towards freedom. EVERYONE IS AN ARTIST, said Beuys. His claim has often been misconstrued. Beuys did not mean that each man is a painter, but he referred to the qualities that everybody can exploit in their jobs, whatever they are, whether a worker or a professional. Beuys' concept was fully respectful of human creative power and activities and summed up all his ideas. It is an anthropological creativeness, a spur to live life to its full and exist in the universe creatively, because man has the power to influence the social dimension, not to be considered as an inertial material but as a whole, including all human intellectual faculties. 1. The concept of creativeness is deeply rooted in human nature and closely linked to freedom. 2. The concept of freedom is twofold: the former aspect concerns individuals, who are free to do what they like; the latter and more important aspect deals with personal relationships, which means making the fruits of free human activity available for everyone to enjoy. 3. Communication is meant as the fundamental value in every social relationship and concerns all creative dimensions. Beuys considers it as more than a mere possibility ("Our duty is to show what we have done with our freedom"). 4. For each individual, creativity is articulated on three main levels: thought, feeling and will. The connection to the "Theory of Sculpture" is evident in this statement, which leads us to maintain that creativeness is the implementation of that theory. 5. Creativeness is not solely destined to man. In other settings, even a tree – for example – may show its energy as far as thought, feeling and will are concerned. 6. Beuys criticized materialism, stemming from the unilateral development of the power of thought, disregarding other vital aspects of human and natural creativeness. 7. A remedy to this misconduct needs to be found by seeking alternative routes to both capitalism and consumerism. It is therefore necessary to develop real models offering a social organization where human faculties may be fully expressed and fulfilled. Reaching the goal of freedom, whether for man, a country or the whole world, must go hand in hand with the attainment of non-violence. Revolution is within us. The only possible revolution lies in our ideas. ‘WE ARE REVOLUTION’: another famous claim made by Beuys. Evolution is only achieved through our behaviour and understanding. Beuys used to sculpt with his words and teach with his works. He did not embody an abstract concept of Utopia because he practised a Concrete Utopia, which is only understood and acknowledged by those who deem it necessary to turn to a different way of feeling, perceiving, knowing and acting. Beuys' Social Sculpture is meant as a continuous process whereby the ecological, political, economic, historical and cultural connections forming the social establishment continuously change and grow. Only through Living Sculpture is it possible to uproot the vile system enslaving modern man, in order to reach a co-operation of free men of different races, origin, religion, social class, cultural and economic groups. Beuys' works all show a strong symbolic bias, partly connected to an experimental scientific approach and partly ascribed to the scope of human intuition and creative power. This is also evident in Beuys' way of dressing. His hat was a symbol of wisdom and knowledge, his fisher vest recalled the figure of a 'soul fisher', a shaman and Christ himself, while the hare skin piece pinned to his chest hinted at movement and metempsychosis- His jeans were a testimony of the revolution of customs, his boots showed the dynamic soul of a wayfarer. All the materials used by Beuys showed a wide range of symbolic meanings. I have defined Joseph Beuys, the most outstanding and significant sculptor of the 20th century, a sculptor of shapes and souls. In his sculpting works Beuys used all the materials that I define Visible and metaphorically hint at energy and heat (copper, felt, fat, wine), whereas he used Invisible materials – words, gestures, intuition, smells, sounds, noise and behaviour – to create his social sculpture, i.e., Living Sculpture, in order to accomplish a process of joint co-operation between different individuals, always respecting human freedom and creativeness. As a consequence, the materials he used in his works, actions and lectures have nothing in common with the ones used by Art Brut or American Minimalists, as they overcome the mere representation process and interpret the flow of human energy as well as the flow of life and death, man and art's social dimension in a natural, primitive sense. It is therefore self-evident that the dimension of art coincided with life in Beuys' thought, which is an instance ofAnthropological Art. This concept divides new art from the traditional as well as the past from present. Beuys' art is constantly projected towards future: the future of art and mankind. Beuys' art also encompassed economic issues intertwined with social and cultural ones. Another important claim made by Beuys is that KUNST = KAPITAL. In his statement he considered culture as the primary capital of society. The most important economic force arises from human abilities. Throughout his life Beuys developed these concepts, employing all his means and getting personally involved as well. Beuys promoted education as the primary force in the establishment, by creating extremely important educational concepts to spur the rebirth of a civil nation, such as the Organization for Direct Democracy and F.I.U. (Free International University). I would also like to recall Beuys' Appello per l’Alternativa e Azione Terza Via – Iniziativa promozionale – Idea e tentativo pratico per realizzare una alternativa ai sistemi sociali esistenti nell’Occidente e nell’Oriente. Beuys warns us that mankind is doomed to an ecological crisis which will constantly progress more and more dramatically. We will also be helplessly exposed to the growing threat of mindless warfare as well as the widening gap between rich and poor countries, continuously tormented by racial hatred, religious clashes, nationalism, exploitation, oppression, humiliation and violence, the supremacy of economic and political power and biological and social manipulation. Beuys was a precursor of the European Union because he felt the need for a free-market community sharing a single currency. 13. Final recapitulation and discussion. Joseph Beuys hoped that all men would be able to reach equality in freedom and rights. He fought to promote market economy (an Organic economic system), a factual change in the concept of money and a system based on the right to work. He was interested in the protection of disappearing crops and produce as well as biological farming. He set up a partnership for the support of third-world countries. To this regard, I would like to point out the prophetic quality and importance of Joseph Beuys' thought. He was a true shaman-artist, the precursor of theories focused on social needs and present-day issues. He actually anticipated all the economical, environmental, humanitarian, political and cultural issues affecting mankind today. DEFENSE OF NATURE is Joseph Beuys' last masterpiece. The final claim of the German artist is a phenomenological unicuum in art worldwide. He devoted the last 15 years of his life to this titanic operation in Italy, where the artist developed his strong operational and spiritual commitment with my constant support, in a context where limitless action has a basic role in the interplay between the expansion of thought and human energy. The relationship with nature is a constant theme in Beuys' thought. His work on this topic started with archetypical drawings in his early years of artistic activity and was resumed in his late life with his commitment in support of man and the protection of nature. Joseph Beuys' Defense of Nature is not only intended within an ecological scope, but an anthropological one too, as it is essentially a defence of man, human values and creativeness. In the past few years after his demise, much has been written on Beuys's work and life. Literature on Beuys has been published in many countries and in different languages but – maybe deliberately – little, too little has been said about the important marks that Joseph Beuys left in Italy (namely, in Abruzzo) in the last 15 years of his life. Italy is a constant destination of long-wished trips for the romantic souls of many famous Northern Europeans, such as Goethe, Nietzsche and Beuys himself. However, Beuys drastically changed the pensive quality of this topos of German culture by turning it into a makeover of the natural setting and soil. His presence in Italy was constant from 1971 up until a few days before his death; he remained in Italy longer than in any other country. I do not think Beuys' extended stay in Italy was casual. On the contrary, I believe his was a deliberate cultural choice because he found that the territory – with its alternate availability of natural elements and the human factor – exerted a strong intuitive pressure on him, both as an artist and as a man. Joseph Beuys found fertile soil where to plant the seeds of his beliefs, based on the love and brotherly co-operation of free, creative men. I met Beuys by chance, on a ferry to Capri. He was with his family and Lucio Amelio. We spent the weekend together, which marked the starting point of my great trip into the world of art and beyond. That trip changed my life completely as I started my work on both a private and public level, which still involves me more than ever. Three important public lectures were held in Pescara and Bolognano: Incontro con Beuys (1974). Istituto per la Rinascita dell’Agricoltura (1978) – where he introduced the Free International University to Italy for the first time, through the publication in Italian of his little red book, Terza Via – and the Defense of Nature (1984). The latter event represented the conclusion of an intense nine years working on the Defense of Nature operation, started with the 1975 Aratura Biologica and still ongoing. Other works were created in this context, such as Grassello Pescara –Dusseldorf, Il Clavicembalo,Vino e Olio F.I.U., Piantagione Coco de Mer e Coconut Seychelles , Piantagione Paradise Bolognano, Olivestone, Ombelico di Venere.Two works were left incomplete, due to the artist's death: Fame nel Mondo – Svecciatoio – and Operazione Elicottero. 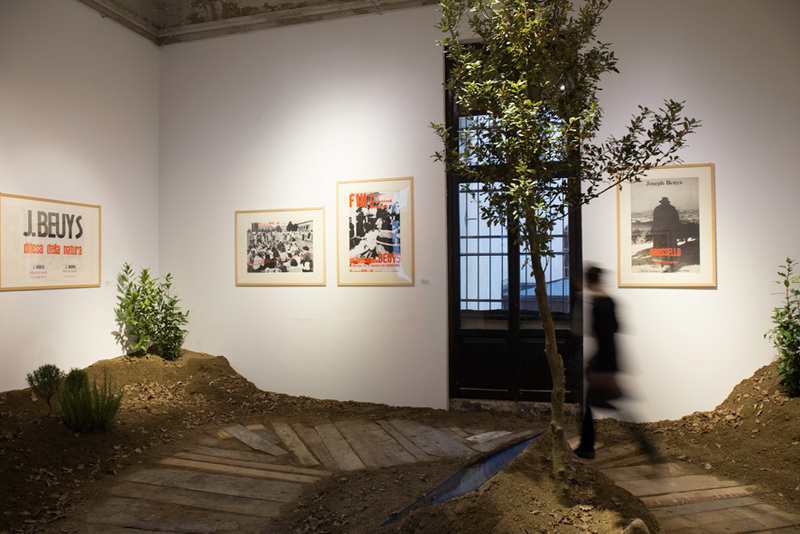 Beuys had an important studio in Bolognano, an estate that he called Paradise, a project involving the planting of 7000 trees of different disappearing species, still ongoing. Moreover, 13 May 1974 is a date worth remembering. On that day, on the occasion of the famous debate Defense of Nature, he was awarded the honorary citizenship of Bolognano. However, as far as I am concerned, Beuys' Defense of Nature actually started after the artist's death. The Defense of Nature operation then became a mission, a project of the utmost importance for me, aimed at spreading and understanding Beuys' thought. You don't preserve a memory, you rebuild it. I used a wide range of communication means – conferences, essays, lectures, literature, meetings, graduation theses, donations – to this purpose. I have also created Risk Arte Oggi, a magazine devoted to cultural communication exchange based on Beuys's thought. At all times I have always respected and reflected on the two basic aspects of Beuys' thought which most embody his uniqueness: re-acquisition and free creativeness. The former consists in an attitude rarely found, aimed at rebuilding rather than conquering new territories, discovering rather than inventing, therapeutically improving rather than replacing. It involves the need for widening and extending human power in order to attain the knowledge of truth. To this regard, Beuys' work throughout his life embodied his need for communication and expressing his thought by any possible means. The latter aspect is characterized by the well-known concept of free creativity, that Beuys always preached and taught all over the world. 15 years after Defense of Nature, the famous debate, Piazza Joseph Beuys was inaugurated by Harald Szeemann in Bolognano on 13 May 1999. The unique square was not only named after him, but also specially built according to the artist's concepts: Nature and Man, the only square in the world to be so. Piazza Joseph Beuys has an amphitheatre structure, overlooking the valley. It contains four large terraced green herbaceous beds, with rosemary for energy, laurel for the alterity of art, an olive tree for heat and fruitfulness and an oak for long life and strength. The latter tree was planted by Harald Szeemann on the same day Piazza Joseph Beuys was inaugurated, in memory of the first oak tree planted by Beuys on 13 May 1984 in his Paradise Estate, as a forerunner of the 7000 Kassel oaks. The four herbaceous beds are symbols of the four cardinal points of Beuys' philosophy: cosmic love, communication, creativity and human values. Joseph Beuys is one of the most outstanding and significant artists in the history of world's art in the second post-war years. More than any other artist, Beuys had the ability and willpower to embody a figure overcoming art in his efforts aimed at reaching the utopian dimension of natural energy and spiritual communication: reality as a phenomenological range of human potential. The process of deepening the knowledge of Beuys's art, studying and reading Joseph Beuys' art is still in progress. The entire third millennium will be deeply rooted in Beuys' thought.